Dubai officially has a new icon. After almost 10 years in the making, Dubai Frame finally opened to the public in January 2018. 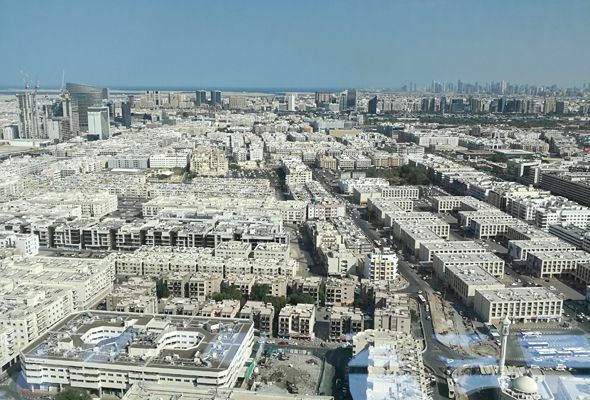 The landmark, located in Zabeel Park, has not only been designed to “frame” some of the city’s most iconic buildings when you look at it from a distance, but also offers spectacular views of Dubai from the top of the 150-metre-high structure. Dubai Frame is located at Gate 4 of Zabeel Park. This location was chosen because it’s close to the heart of the city, with uninterrupted views over both old and new Dubai. There’s plenty of parking around the park, or the closest metro station is Al Jafiliya on the red line. Dubai Frame is open daily from 9am to 9pm. You can purchase tickets at the gate (in the coming weeks you’ll be able to book tickets online or using an app, but right now it’s the old-fashioned way using paper tickets). Tickets cost Dhs50 for adults, Dhs20 for children, with free entry for children under three and disabled visitors. Before you enter Dubai Frame, you have to go through a quick security check. If you have luggage or large bags, there’s an area at reception where you can store these. The first thing you’ll see is the “Dubai Frame Exhibition”, which tells the story of how Dubai Frame came to be. You’ll then be guided through a mysterious curtain of mist. On the other side is a neat little museum – the “Past Dubai Gallery” – which shows the Dubai of yesteryear using projections and multimedia displays. It’s a very cool, immersive experience (but no photography is allowed at this point). Once you’ve walked through the museum, you’ll be asked to wait for the next available elevator, which will whizz you up 48 floors in 75 seconds. The elevator features a glass panel, so you can watch the views unfold as you get closer to the top. The top of Dubai Frame is a spacious viewing gallery, from which you can see the gleaming skyscrapers of Downtown to the south, and the low-rises of Deira and Dubai Creek to the north. There are touchscreen displays that show you exactly what you’re looking at, pointing out some of the city’s most important landmarks. The star of the show is a 25-square-metre transparent walkway that runs along the centre of the viewing gallery. The walkway looks like frosted glass until you step on it – and then it turns clear, revealing the jaw-dropping view of Dubai beneath your feet. It’s a little scary at first – but you’ll be tap dancing across it in no time. You’ll also find two small kiosks at the top selling sweets – Godiva Chocolates and Japanese bakery Yamanote Atelier. You’re given 20 minutes to check out the views at the top, and then it’s time to come back down to earth, using the elevator on the other side. Then you’ll be shown a visionary 3D presentation – the “Future Dubai Gallery” – which imagines the city 50 years from now. You’ll emerge, blinking, into the Dubai Frame souvenir shop, where you can pick up mugs, t-shirts and keychains emblazoned with the icon. Is Dubai Frame worth it? Absolutely. 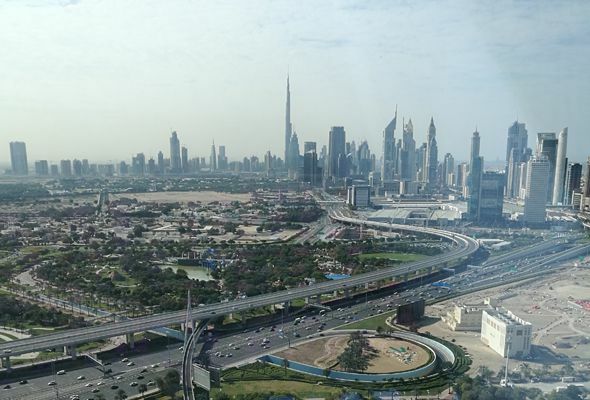 We can’t think of anywhere else in the city that gives you a better view of both old and new Dubai. It’s a great place to get your bearings, and discover just how diverse this city really is. The museum is excellent, too. Make sure you have at least an hour to take it all in. Hate heights? We promise it’s not as bad as it looks. 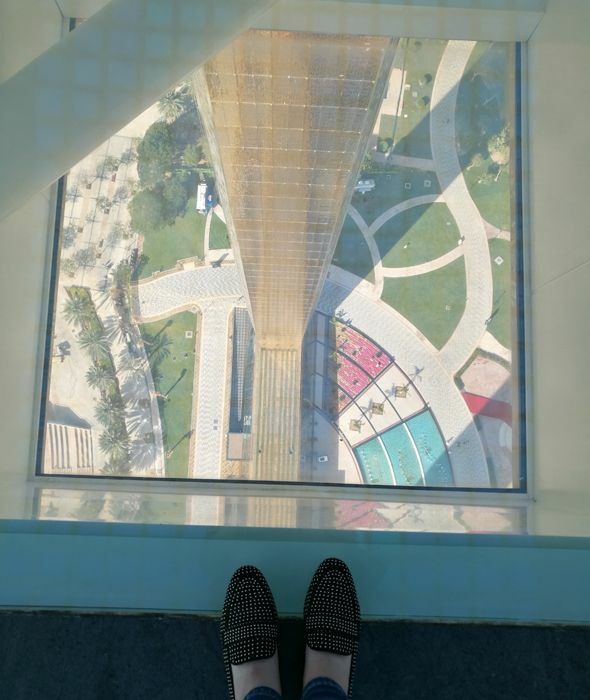 The glass walkway is just a small part of the attraction, so you don’t even have to step on it if you don’t want to – but we definitely recommend giving it a go, purely for the surreal factor. ◆ The frame measures 150 metres high and 93 metres wide. ◆ It was constructed using 2000 tons of steel and 2,900 square metres of laminated glass. ◆ It boasts 15,000 square metres of gold cladding. ◆ The golden ring design on the frame was inspired by the Expo 2020 logo. ◆ It was designed by award-winning architect Fernando Donis, who also designed Dubai’s Porsche Design Towers, and the Dubai Renaissance Tower. ◆ The project cost Dhs160 million.